NEW! Our Choose One program is brought to you after many requests for someone to take over managing your digital presence and social media for you. We still believe that the ideal way to engage and interact with your clients building relationships with them is to learn the best practices and be involved yourself in social networking. We also realize that it is not for everyone and many would like assistance. 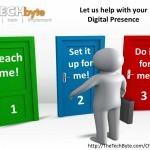 How can The Tech Byte help with your Social Networking and Blogging efforts? We offer many opportunities for you to learn social networking and blogging from the ground up. We have instructors to train you how to build your networks and profiles and we can also teach you the best practices in using social networking to build your audience and digital presence. Please see our Individual Training Bytes for pricing and to get started. If you would like to hire someone to set up your various social networks (Facebook, Twitter, Google+, LinkedIn, and more) then take the reigns from there, see the Training Bytes to sign up. We can be flexible on our packages and will customize just for you. Our newest package is the all-inclusive social networking package that allows you to just know that it is being taken care of. We will set up notifications for you to monitor any leads or hot questions as well as send you weekly reports of activity and posts. Visit our Networking Byte page to choose a package that is just right for you.